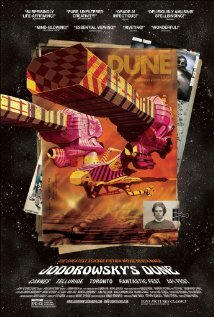 To see Jodorowsky’s Dune is to enter a magical world of cosmological possibility. Theoretically, the film is a documentary about the making of a famous movie that never got made. In actuality, it’s a tribute to the human spirit…especially the human spirit at the age of 85 as created by Alejandro Jodorowsky. Jodorowsky’s life story carries the flair of a tale from The Arabian Nights. Intuitively – admitting he’d not read the novel that pops from his mouth –Jodorowsky named Frank Herbert’s complex, sophisticated and internationally acclaimed science fiction book, Dune. When life gets larger than fiction, a documentary is born. It’s not news that Jodorosky never got to make Dune. It’s probably not even news that Jodorowsky’s Dune influenced more in failure than it might have in success. One science fiction film after another lifted ideas from its extensive story-boarded illustrations. What is news is that Jodorowsky’s life shines forth brighter than ever 35 years after he took up the Genie’s offer and left his film forever in the collective mind to imagine. On screen himself, he’s a talking myth, expanding reality with an inspired vision of possibility for old age as he ages. When Jodorowsky set out to make Dune, he said he was not making a picture. He was making a prophet, a film that would change the minds of young and old. He saw film as an impactful, dynamic force that could change the way people think, bring them into a more meaningful and generous connection with one another. In his own words, he explains how he intended the film to open his own ego, to spirit him to another level of consciousness. He loved – and still does love — being ambitious. To accomplish his mission, he needed what he called “spiritual warriors”, artists of superb talent who would bring his fantastical vision of Dune to life for all to see. As he’s interviewed in the documentary, Jodorowsky recounts each journey he took to engage each artist who joined him. It’s a fun trip, not for the feint of heart. Jodorowsky is a man who never met an obstacle he didn’t like. When he couldn’t feel the spirit behind the talent, he simply left the room. Many of Jodorowsky’s dream team are very young, all very talented and many very famous. Each is visually recognizable by their art on paper, on the stage or the big screen. There’s Dan O’Bannon – American screenwriter and special effects designer (Dark Star), Chris Foss – English illustrator of sci-fi book covers, Jean “Moebius” Giraud – French cartoonist and H.R. Giger, Swiss painter and graphic artist (Aliens). Jodorowsky’s Dune cast included such luminous figures as Orson Welles, Mick Jagger, David Carradine and Salvador Dali. Also, Pink Floyd and the French Group Magma. 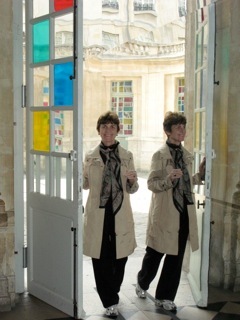 Incredibly, with great anecdotes for each negotiation, they all say ‘yes’. The man is a master negotiator. Close listening to the stories of how he brought each artist to say ‘yes’ provide an education. O’Bannon moved to Paris with barely a dime in his pocket. Dali insisted on $100,000 a minute – even after Jodorowsky cast his girl friend! One colorful story, told in a tone of true wonder, recounts Mick Jagger meeting his eye across a crowded room and how ‘yes’ was made via a smile of recognition and a handclasp. Director Frank Pavich skillfully and delightfully reveals Jodorowsky’s soul making endeavor with Dune and his certainty that dreams pursued exist in real life whether or not they ever materialize. The years between Hollywood’s rejection of Dune and Jodorowsky’s renewed dedication to filmmaking at 84 reveal a man who never stopped creating. There may be no connection between Jodorwsky’s desire to create soul in himself and his pick of a sci-fi novel that celebrates spice as the secret ingredient that drives ambitious heights of creative achievement but I’d like to believe there is. 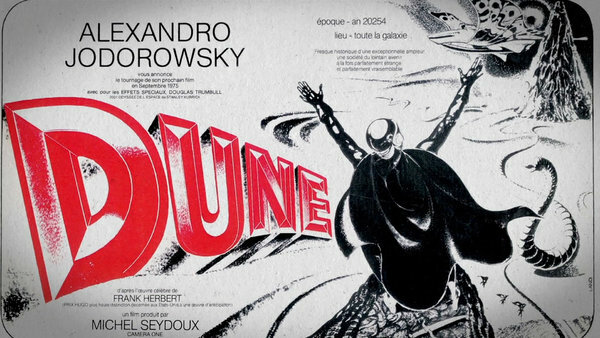 For all those who want to receive the boon of an elder hero, a hero who did not get to bring his prophet to the big screen but who embodies, in his late years, his own spice-inspired ending to Herbert’s Dune, see Jodorowsky’s Dune. When Jodorowsky says “To me, the picture, I did it”, his psycho-magical self leaps personally from the screen to cultural psyche to make his point.